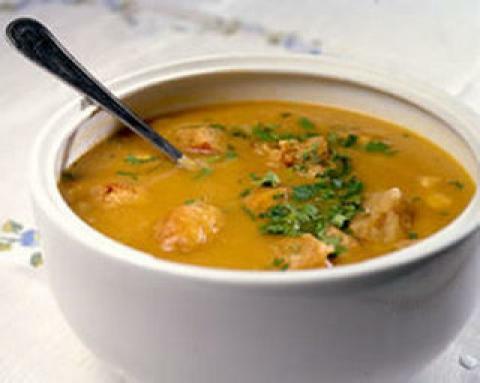 In Cape Verde, this soup is thickened by the addition of both "mandioca" - a flour made from manioc, and "farinha de pau" - crushed, dried bread crumbs. Manioc flour is not as unfamiliar as it might sound. It's the same thing as tapioca flour, made from the starchy tuber known variously as manioc or cassava. If you can't find tapioca flour, you can substitute quick-cooking, or "minute" tapioca. In a mixing bowl, dissolve salt in enough water to cover the banana pieces. Dump them in, and soak for 10-15 minutes to draw out the "pucker" quality of the unripe fruit. Meanwhile, in a deep skillet or heavy stew pot, brown onion in il over moderate heat. Add garlic, bay leaf, pepper, parsley and tomato, and saute for several minutes, stirring frequently. Stir in 4 cups hot water. In a seperate bowl, use a bit of the hot broth to whisk the tapioca flour into a thin, smooth paste. Bring soup almost to a boil and add the paste and bread crumbs, stirring vigorously. Immediately reduce heat to simmer. Drain the bananas and add them, along with the cabbage and potatoes. Gently lay in the fish, cover with water, and simmer for 20-30 minutes, or until everything is done.